Easily manage your personalized game data by using Bowlr’s simple input methods to track your scores and view your stats as you progress. Bowler provides a user-friendly, flexible format for tracking your games. Keep track of all your games including leagues, tournaments, and practice. All data is seamlessly synced and backed up across devices. Flexible scoring options allow you to input scores frame-by-frame, or by providing a final score. Add additional data to each game to get a deeper level of tracking. Dive into your stats to get interesting insights that help improve your game. Built for all levels of bowlers to help track and improve their game. Leages and tournaments can be created so games can be added and tracked against specific events. Two game modes are provided: frame-by-frame & final score. This gives bowlers the flexibility to enter in scores the way that works best for them. 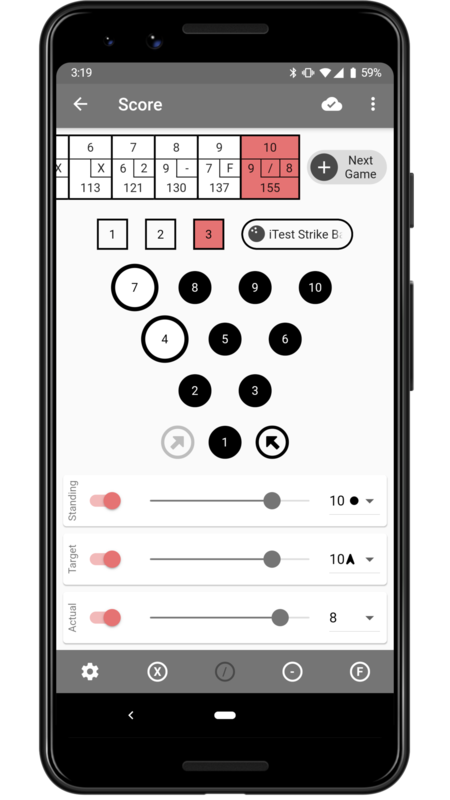 In frame-by-frame scoring mode, bowlers can choose to provide frame scores by the exact pins or just by the number of pins. Capture additional data beyond just scores. This includes items such as the house, ball(s) used, lanes, and oil patterns. Bowlers can mark games for quick-finding in the future. Notes can also be added for further explanations and insights. A large number of stats are provided to help bowlers understand their game data. Filtering allows stats and games to be analyzed more in depth. We really think you'll like Bowlr. Give it a shot and let us know what you think!